Wisely ignoring the somewhat confusing timeline of the Halloween franchise, 2018’s instalment is set forty years after John Carpenter’s 1978 classic. Masked maniac Michael Myers (James Jude Courtney teamed with the original Halloween’s Nick Castle) hasn’t uttered a word while incarcerated in a mental institution. Despite frequent attempts by his new psychiatrist Dr Sartain (Haluk Bilginer) and visiting, rather annoying podcasters Aaron Korey (Jefferson Hall) and Dana Haines (Rhian Rees). Meanwhile, survivor Laurie Strode’s (Jamie Lee Curtis) life has been defined by the massacre she narrowly escaped. Her post-traumatic stress disorder has caused her marriages to fail and her daughter Karen (Judy Greer) to be taken away as a child due to Laurie’s insistence on instilling tough survival skills. Their relationship remains strained as Laurie voices safety concerns over her teenage granddaughter Allyson (Andi Matichak). There’s a sense of regret over the way Laurie feels she had to raise her daughter, but she remains adamant it was necessary. She’s soon proved right as Myers manages to escape during a prison transfer and is soon partaking is his favourite Halloween tradition. While Carpenter’s influential slasher should have been a one-and-done movie with its enigmatic, unstoppable killer who has no motive. Centring around the reality that sometimes evil is just evil and our inability to relate to, reason with or analyse is exactly what strikes fear into us. It’s a formula that was once lean and highly effective but waned with each sequel. This Halloween does have the thread of PTSD, a theme that could have been fleshed out thoroughly in place of flat humour and a questionable twist. However, unlike Rob Zombie’s reboots, Myers crucially remains a mystery, living up to his enigmatic moniker “The Shape”. 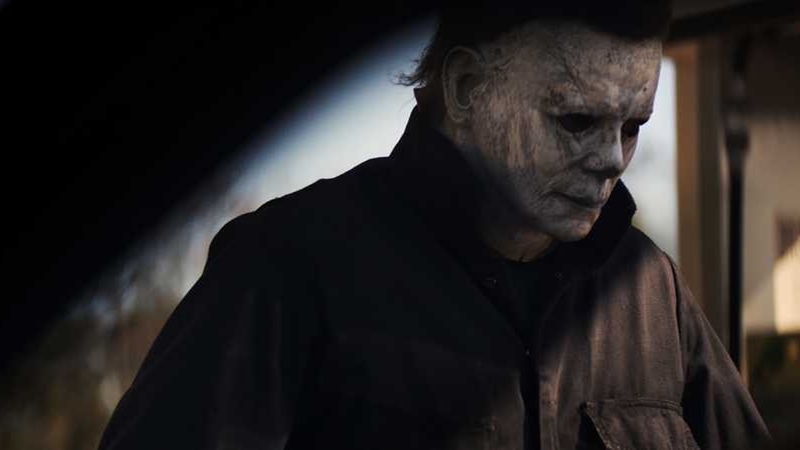 Even before brutally reclaiming his signature mask, Myers’ face remains obscured and any attempts to dig deeper into his psyche are fruitless. He then drifts between deaths, cinematographer Michael Simmonds skillfully mimics Dean Cundey’s shots from the original, with no method to his madness. While not able to recapture the dread of the original, writer-director David Gordon Green and co-writers Danny McBride and Jeff Fradley at the very least understand the appeal of a silent killer. Curtis revives her role as Laurie with gusto and despite the role reversal of the hunter becoming the hunted, she isn’t painted as a one dimensional, revengeful killing machine. Laurie is as fragile as she is hell-bent on finally closing a blood-curdling chapter in her life. While the film sadly only scrapes the surface of her PTSD, it does convey her inability to move on, which comes to a head at an awkward family dinner. Greer and Matichak nicely complete the three generations that do battle, showcasing both fear and wit in equal measure. As Myers’ new psychiatrist, Bilginer was slightly distracting as he appeared to be impersonating Donald Pleasence as Dr Loomis and inevitably pales in comparison. 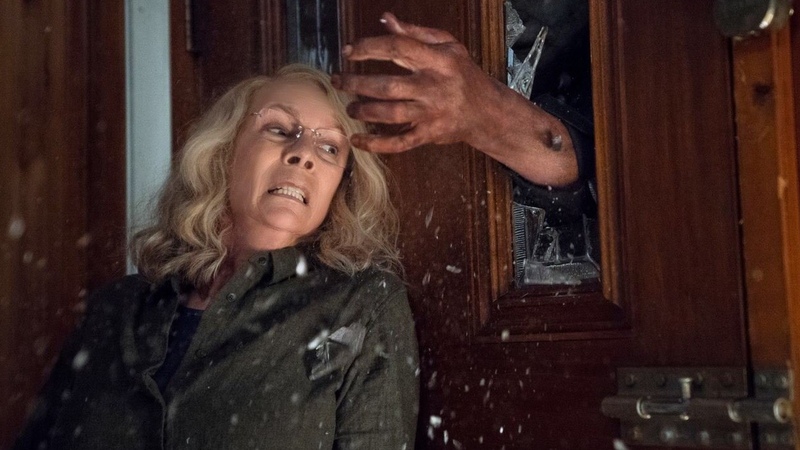 There’s callback galore to the original Halloween with frenzied wardrobe attacks and balcony disappearing acts. Slightly more subtle nods include Myers finding himself at home and his weapon of choice in a poor soul’s kitchen. As well as startling misdirection from a classroom window gaze and washing eerily blowing in the wind. Most reinforce that the tables have turned, or provide a fleeting scare as a false alarm and generally avoid becoming self-indulgent fan service. The film’s score stole the show for me, with Carpenter returning to the franchise alongside his son Cody Carpenter and godson Daniel Davies. Halloween’s iconic theme receives a menacing, ramped-up makeover and entirely new entries erupt with the same intense urgency. Thumping over the opening credits as a withered pumpkin reforms was the most low-key and effective homage to the original film. Aside from a handful of comedic missteps and an eye-rolling twist, David Gordon Green’s instalment does efficiently return to the horror staple’s roots by reinforcing Michael Myers’ mystique. Although how a certain teen doesn’t end up impaled remains the biggest mystery.